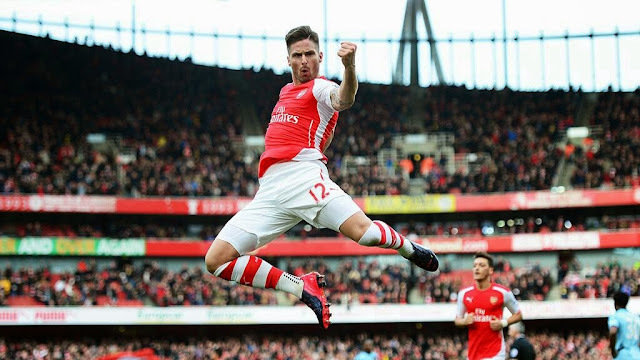 Can Giroud Clinch Glory for the Gunners? Giroud has been on fire after scoring in most of Arsenal's wins this season. Giroud has 5 goals in his last 5 for Arsenal. Is Giroud unstoppable? Olivier Giroud has been on top form since his return from injury. Can Arsenal win the league? After Giroud has taken over the form of Welbeck and Sanchez, he scored 2 of Arsenal's only two goals at Newcastle on Saturday 21st March 2015. He almost sent Arsenal through to the Quarter Finals of the Champions League, when he scored against Monaco on Tuesday 17th March 2015. After a long period out of the game for club and country he has got 6 goals in 4 games for France and 17 in 19 games for the Gunners. Giroud joined Arsenal in 2013 and didn't get many goals in his 2013/14 season. At the start of the 2014/15 season the Frenchman has 22 goals in all competitions for Arsenal with goals in the Champions League, FA Cup and Barclays Premier League. He will now be a vital part to Arsenal's FA Cup Semi-Final against Reading and the last 7 League games. Will Giroud fill Arsenal up with the last 16 points up for grabs? With Chelsea and Manchester United playing each other and Arsenal playing Chelsea and Manchester United Arsenal could beat Chelsea and United could also beat Chelsea so Arsenal could top the league and win. If Chelsea lose or draw the rest of their league games and Arsenal easily win their last lot of games Arsenal have a high chance of being victorious. Can the Gunners win the Barclays Premier League and the FA Cup? TheSportMatrix • We Live For Sport: Can Giroud Clinch Glory for the Gunners? Olivier Giroud Review. Is he Unstoppable? Could he win Arsenal the League?